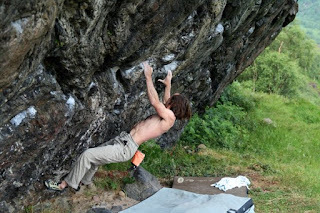 Despite the weather breaking down somewhat into heavy showers typical of July now, some folk have managed to get out bouldering, with some cool NE winds in May and June providing better conditions for pebble-wrestling. 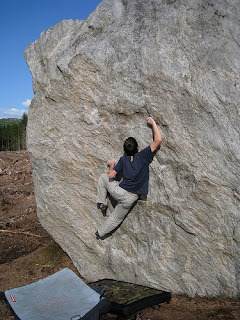 Jamie Murray showed Richie Betts and Mike Lee the 'Jamie' boulder near Farr in Inverness, which is a clean gneiss boulder revealed from the cleared forest with plenty of mid-grade lines on it. The big face project was completed by Mike before he has to start something called 'work'! I visited Dave and Claire MacLeod in Fortwilliam and listened in awe to tales of working a possible E12 on Ben Nevis, the photographing of which looked as epic as working it... check Claire's blog (buy a hamper while you're there!) Dave managed to link the Echo Wall roofs before heading to the States on lecture duties. How does he get the stamina? Well, I found out. We went up to Sky Pilot crag for a bouldering session, I thought I'd get back into bouldering after a three month lay-off and was beaten up by the power and technique required for the crux of the superb Beatleback. Now bear in mind this is a long Font 7c traverse with a desperate drop-down sequence. At the end of this ten metre traverse, Dave added on Burning the Candle, a power 7b+. 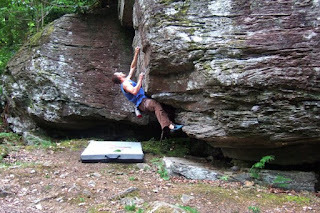 Not only that, he linked it into Tinderbox (7a) on the left, with a bat-hang rest and sloper sequence to join Beatleback. Not only that, but it starts at the far left of the main crag. About forty metres, all told, an 8c+ route or thereabouts... anyway, he's close to the link, but no cigar yet. If Dave's hair touches down, does this count as aid?! Dave has also added new problems to the Pine Alps boulders on the other side and will be doing a topo for the bouldering hopefully. 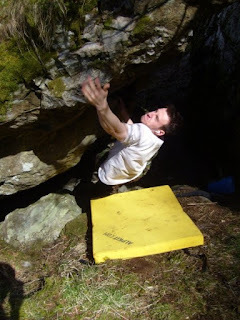 The twin crack on the Waterfall boulder, sit start and a crux slap to a small crack sloper. High finish. The Skeleton boulder lies to the left of the Waterfall boulder. Climb the right prow of the cave all the way direct. The full left to right traverse of the front face of the Skeleton boulder, reversing Sylvestris (7a ish) to a desperate sequence over the plinth boulders to the far right. Sit start at the right arête and follow Getting Lippy (6c+) to the left arête, drop down to flat holds and move left to below The Chop (7a). Finish up this. Sit start at low flat holds right of The Chop. 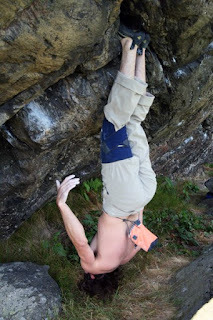 Reverse Getting Lippy (6c+) to holds below the groove of Too Hard Too High (6c+). Finish up this and do battle with it's rounded topout! Magnus Johnson has been developing the mossy schist boulders near Kinlochleven at GR 149609, reoprting that there are a lot of blank roofs and some fun problems in a 'Lord of the Rings' atmosphere. Here's a pic of one he calls Sloper Joe. 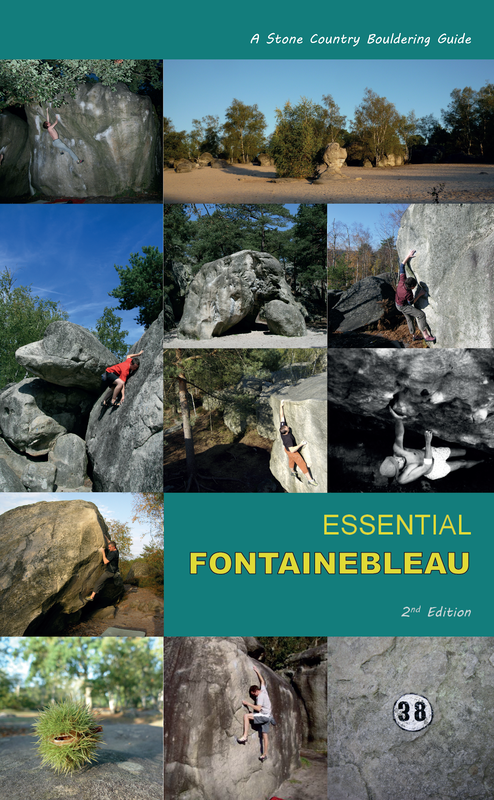 Pete Murray kindly gave me a trailer of an interview he did with me in the Lost Valley, which discusses the new Bouldering Guide and has some footage which appeared in his film Elements. 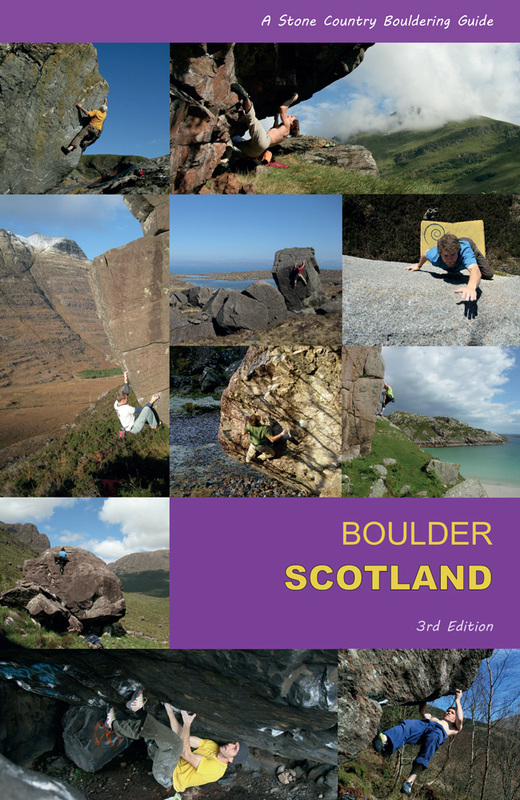 Remember, if you want to buy the 3 for 2 offer, Stone Play + Bouldering in Scotland + Elements, (for only £40) the offer is on the main site on the books page. Hi, just for some clarification. 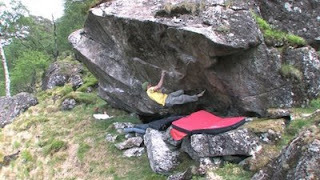 The 'jamie' boulder is the 'Farr away boulder' as reported on his blog. Really good round up of whats going on.